Time and again we encounter people with bad credit who feel their backs are against the wall and they cannot borrow money or finance emergency needs because of their financial history. The truth is, if you know where to look you can get approved for installment loans online, providing you quick & easy access to money for whatever your needs are. The following article will outline everything you need to know about installment lending so that you too can get cash quickly whenever you require it. Are You An Emergency Magnet… Barely One Step Ahead of Financial Disaster and Ruin? How Can I Pay Off My Credit Cards? Installment financing is only a fancy way of referring to a lending agreement where you agree to make scheduled payments over time - usually monthly. It refers to the repayment structure associated with your borrowing, for example your typical home mortgage is a 30 year installment loan because you agree to repay the balance in small chunks at scheduled intervals each month. Installment loans for bad credit are simply structured borrowing opportunities from lenders that work with people who have a bad financial history. 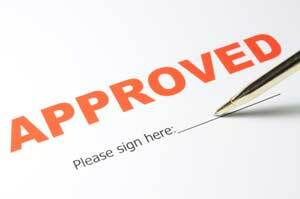 Will My Loan Get Approved With Bad Credit? Having a bad financial past is costly, frustrating, disheartening, and a nuisance, but it is NOT the end of the world. While it may seem that you will not be approved for any type of loan ever again, this is not the case as we will outline below. In fact there are various ways in which people with a bad FICO can apply and get approval. For cheaper lending you will face a more difficult application process, more stringent terms and a requirement for security or a higher interest rate. If you want to borrow money and fix your credit, your option is to work with the lenders available to you and reestablish your financial reputation as a borrower. "Feel Cash In Your Pocket Again with More Time for Repayment..."
Of course, the goal is to have as many positive items as possible and as few negative items in your history. Find out which company is our top recommended credit repairing services and start building a positive payment history today to qualify for better loan offers. While you work to remove the negative items being reported you can monthly add to the positive items being reported. It may feel like forever to rebuild your financial reputation, especially when you feel surrounded by insurmountable debts and bills with no way to meet them in sight. If you take it one step at a time, I guarantee you will get there. One of the most dreadful situations that can happen when you have a bad rating is an emergency need for urgent cash. If your history is bad enough, with bankruptcies, foreclosures, evictions and numerous defaults, qualifying the traditional way with most direct lenders is impossible. Especially in a need for quick cash, you will be rejected by conventional lending institutions and banks. This is the point most people give up. The banks turned you away so it is impossible to get a loan right? Well... You actually have an option if you need to borrow money. In fact you have several options to choose from depending on your situation and need. There exist a number of alternative financing options; programs specifically designed to give you a second chance financing opportunity to rebuild your reputation. Surprisingly the approval requirements are easy. Personal loans are a good option for people who need money and have been rejected by conventional lending institutions. The monthly repayment structure provides an organized, consistent schedule for paying back what you borrow that is easy to manage and the approval requirements are easy. A payday loan is one of the fastest options if you need quick cash. There are many online and offline companies that provide this type of financing. As the name implies, it is paid on a scheduled basis every payday of the borrower. Your average payday installment loans online will continue repayment as scheduled automatically until the balance is repayed. Web lending is gaining in popularity because it provides a completely hassle free method of applying, funding cash quickly into accounts and managing repayment. To apply, you need only to register online and complete the application through the web application form, providing your information and bank account details so they can fund your account. Once the application has been submitted, approval will be made in a span of an hour or two. Once approved, your money will be automatically credited to your bank account within a few hours or the next day in some cases. Your first scheduled payment will be due on your next payday; depending on the terms of the lender offered you, payment will be automatically debited on the approved schedule, effectively in installments. For more information you can review the FTC fact sheet of installment loan facts. This type of financing can be expensive, but it is extremely flexible, and easy to get approved. If you cannot meet a repayment date, you can inform them to only deduct the interest from your account. Once you have enough money to payoff your debt, even if it is before the end of term, you may do so and rebates will be deducted from the balance of your loan. Other types include cash advances, this type comes with a few negatives that you should be aware of. First and foremost, payday lending is not the cheapest means of borrowing money. Borrowing costs are high, and the repayment periods are typically short. On the other hand, the benefits of this type of financing can sometimes outweigh the costs because you do not have to apply in person, and especially during urgent situations, the speed of funding has proven invaluable for a lot of borrowers. In most cases, to be eligible for this kind of loan, you need to be a US citizen, employed with a minimum of $1,000 monthly income and have a valid bank account. This is a type of installment loan that can be approved provided that you have something that can be used as security in the event that you default on your scheduled payment installments. There are a few ways a secured loan is usually structured. You can give the lender some collateral in the form of property with value. For example, real estate property and automobiles are two commonly accepted forms of collateral. The added security will entice lenders that would not otherwise lend money to people with a bad financial history. On the other hand, the collateral will be seized if you are not able to adhere to the agreement that you signed with the lending institution. For small amounts, there are lending companies that accept jewelry and small items with value like electronics and appliances as collateral for the proposed bad credit loan. A pawn shop taking high value items in return for a scheduled payment loan is an example of this type of lending. These programs are not the best value in the world but can be especially helpful in a financial pinch. Another option to secure your loan with the lender is to get a guarantor that will be willing to sign an agreement that in the event that you fail in paying for the loan, they will be the one to cover it for you. In this case, investigation and due diligence will be performed for your guarantor, but you and your past financial mistakes are able to sidestep the qualification process. Your guarantor must have a good credit rating and must have a substantial income to be allowed to stand in security for your loan and sign with you. Finally, some lending companies approve applicants even without a guarantor or collateral provided that you pay a cash security deposit and agree to a higher interest rate on the money you borrow. The rates are much higher than prevailing loan interest rates so make sure you have explored all other borrowing options before you pay too much. In the case you have no property of value that can be used as collateral and no guarantor willing and available to sign with you, you will be looking to borrow via unsecured. Bad credit loans are provided by direct lenders, credit unions, a few specialized banks which do not require security or excellent credit to qualify. As financing goes, this is deemed a high risk for lenders - so be prepared for higher interest rates and fees. Since they have no guarantee that the money they let you borrow will be returned, it poses greater risk on their investment. Don't be discouraged though, if weighing the pros and cons you decide its worth the costs, there are online installment loans who specialize in this sort of thing. With a bad financial history you will rarely be offered a high loan amount exceeding $2500 or so unless you have a significant income that can be proved. It is also reasonable that the payment terms will be shorter compared to financing not deemed as a high risk to the direct lenders. Normally, the lending period will last up to a maximum of six months. * Important Note: All collection practices of these lenders will always be in accordance with the principles of any federal regulations. A typical APR for short term programs ranges from 261% to 1304%. Failure to repay the loan on time, delinquency or defaults on the registered account could negatively impact your FICO scores. Renewal policies vary for every lender, please read all the print presented on the application page. Your lender will attempt to qualify you with the best available program you qualify for as a borrower. Eligible borrowers are presented with the terms and costs up front. You are under no obligation until you accept the agreement presented.